Taking a winter road trip is a great way to beat the crowds and get out of the house. However, it makes you more susceptible to adverse weather conditions such as snow and ice. To keep yourself safe on the road, follow these safe driving tips to avoid accidents and other mishaps. While it might be hard to practice driving in snow if you currently don’t have any, that doesn’t mean you can’t pretend. Go to a parking lot and test out your brakes to see if you need to stomp on them or pump on them to come to a complete stop. Get the feel of going into a skid so that you won’t immediately panic if it happens on the road. Keep in mind that if you do need to come to a quick stop in adverse conditions, it will take longer because your tires have less traction. Therefore, give yourself more space between the car in front of you to prevent a collision. Lastly, never jerk the wheel or slam on the brakes if you start to lose control of the vehicle. Instead, apply gentle pressure and ease the wheel back in the intended direction. When you first hit a patch of unplowed snow, your first instinct might be to slow to a crawl to avoid slipping. While you definitely need to slow down, coming to a dead stop could be just as dangerous. You might not be able to get the necessary traction to start back up again. This is especially true on hills. The struggle of climbing paired with the lack of traction could make your car come to a complete stop or start sliding out of control. You might even have to speed up to get some inertia so you can successfully climb over top. 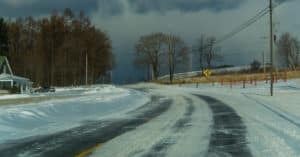 Winter is especially harsh on your car, which is why you need to make sure it’s in tip-top shape before you hit the road. Never let the gas drop below half a tank, as your gas line could start to freeze if it gets too cold. Double check your tire pressure, as the cold causes the pressure to go down. Top off your windshield wiper, anti-freeze, power steering, and other fluids. If possible, switch to winter or all-weather tires to get that extra bit of traction. In addition to your road trip wares, you’ll want to pack emergency rations just in case you get stranded. This should include blankets and extra clothing to keep you warm, as well as food, water, a radio, a flashlight, and road flares. It’s also a good idea to have a first-aid kit on hand, just in case someone is injured in a crash. A lot of staying safe on the road in winter is just using your common sense. Always check the weather forecast before you leave, and if things are looking particularly apocalyptic, delay your trip until the weather gets a bit nicer.